Phew finally the end of another busy week! I thought I'd share a couple of cards I made last week, one for valentines one for a birthday. I tried posting this during the week but never got around to it although now seems the perfect time as said birthday girl had her birthday yesterday. For these cards I dug out a couple of my neglected Gorjuss girl stamps. I love these stamps and love colouring them in, it's just remembering to use them! For Ian's Valentines card I used The Hatter stamp. I coloured the image with Promarkers and kind of stuck to the colours of the image on the packaging. 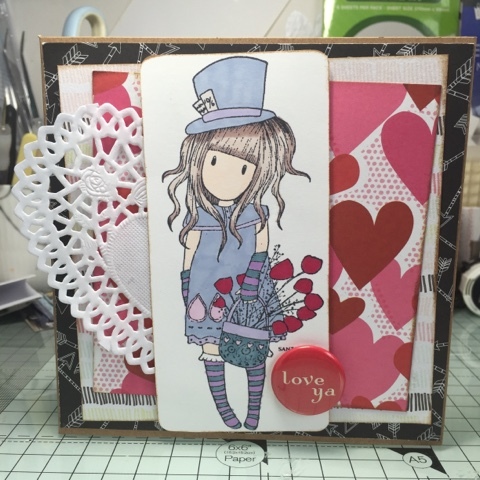 I knew I wanted to use the heart paper from American Crafts cos face it when else would I use it! I also used the B side of this as it made a good base and a piece of WRMK Paper. While searching for something else to put on it I found the Love Ya flair which was perfect! 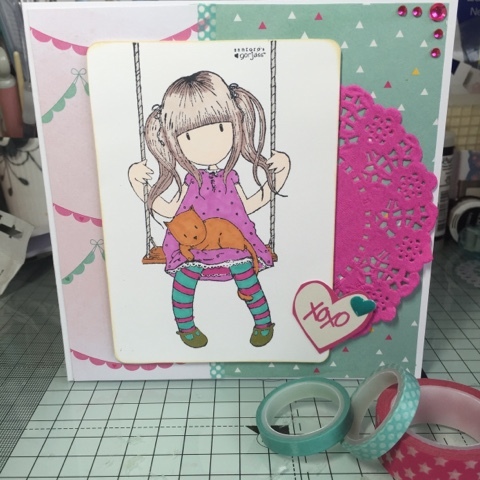 The next card I made was for my friends eldest daughter Ruby. For this I used the Ruby stamp which is one of my favourite Gorjuss images, I even have a framed print of it. Again I coloured the image with Pro Markers and this time used papers from Dear Lizzy Serendipity.